Which is better? bet365 or betfair (Click here to open account on Betfair? I’ve been asked this question many times. I’ve also explained it from time to time on Betting Adda. However questions don’t seem to stop coming so I decided to pen down a post on this topic to end the mystery. 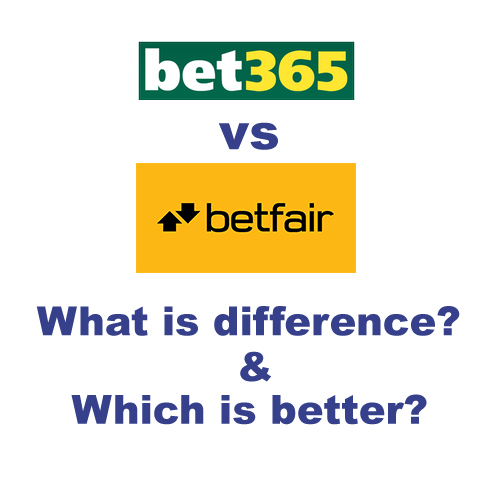 What is similarity between bet365 & betfair? Before explaining the difference between bet365 & betfair let’s see if there is any similarity between these two sites. If you visit betfair website you will see two systems Sportsbook and Exchange. Sportbook is like any other online bookie and it’s similar to bet365. Another system you will see on betfair is Exchange. This Exchange is different, something new & unique, than bet365 or any other online bookies. Betfair exchange allows you to bet against each other (punters). On other online bookies sites, or even with your local bookies, you bet against bookies. On Betfair you bet against other punters like yourself. Betfair introduced lay betting. Desi punters may be familiar with concept of laying which we call “Khawo” or “Kha lo” in desi lingo. However lay betting on betfair is not exactly same as Khawo. When you start using lay betting then you will realise what a wonderful concept this lay betting is. It’s beyond the scope of this article to explain lay betting. Betfair doesn’t charge you commission on just placing bets so do all other online bookies. However other online bookies and Betfair Sportsbook adjust their odds in such a way that commission is included in the odds. Betfair Exchange charges commission on your net winnings only. If you lose you don’t need to pay any commission. Basic commission is 5%. There are other charges as well which you can find on their charges page. This is perhaps the biggest difference which most of punters are looking for. Betfair doesn’t support Indian Ruppes so you have to chose any foreign currency as your main currency and incur forex charges. Lack of support for Indian Rupees on betfair puts off millions of Indian punters. Betfair Sportsbook and bet365 are same. bet365 supports INR so you will probably join bet365 if you are gambling. Betfair Exchange is for trading so you have to join Betfair if you want to trade. Apart form above there are no differences between these two online bookies. Join the one which suits you. None is better or worse than other. « How To Open Account on Betfair From India? You can join http://www.bettingadda.com/ take premium membership there. You can see my tips and predictions on website.